Radish is rich in folic acid, Vitamin C and anthocyanins. The leaves of the radish plant actually contain more Vitamin C, protein and calcium than their roots. They have been used to treat kidney and skin disorders, fight cancer and even soothe insect bites. These nutrients make it a very effective cancer-fighting food. It is said that radish is effective in fighting oral cancer, colon cancer and intestinal cancer as well as kidney and stomach cancers. 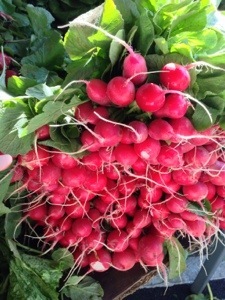 Radishes contain Vitamin C, zinc, B-complex vitamins and phosphorus. All of these are very effective in treating skin disorders such as rashes and dry skin. Mashed raw radish can be used as a soothing and refreshing face pack. Dieters can benefit greatly from radishes, as they are low in calories, cholesterol and fat. They also contain a lot of roughage and contain a lot of water. Because of its high roughage content, it is also very useful in treating both piles and constipation. Radish juice helps to soothe the digestive system and detoxify the body. Radish is a natural diuretic. This makes them effective in preventing and fighting urinary tract infections. Radish juice helps to cure the burning feeling during urinary tract or bladder infections, as it is an excellent kidney cleanser. This root vegetable can be enjoyed either raw or cooked, as well as in juice form. It makes an excellent addition to salad dishes like the one I did here. 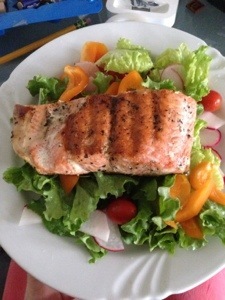 I grilled my salmon, made a great organic salad (my farmers market pick) and dressed it with fresh squeezed lemons.